I love a good vintage find. I'm at my happiest when browsing through rails of vintage pieces at markets or charity stores and this weekend was no exception. I've spoken about Miss Ivy vintage events in the South West in a previous vintage post- Their events are a highlight of my calendar. This time around it was a 60s inspired event called 'All Things Mods, Minis and Scooters'- Plymouth Guildhall was filled with quirky 60s- styled fashionistas and lots of exciting stalls to bumble over, as always. From the same vintage market seller that I purchased my velvet dress from, I picked up this gorgeous satin kimono. 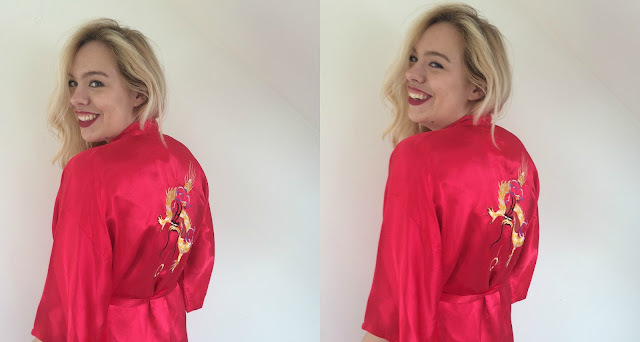 I've been wanting a nice vintage, oriental kimono for ages- My sister pointed out that I was probably inspired by Schmidt from 'New Girl', who is quite literally my spirit animal. 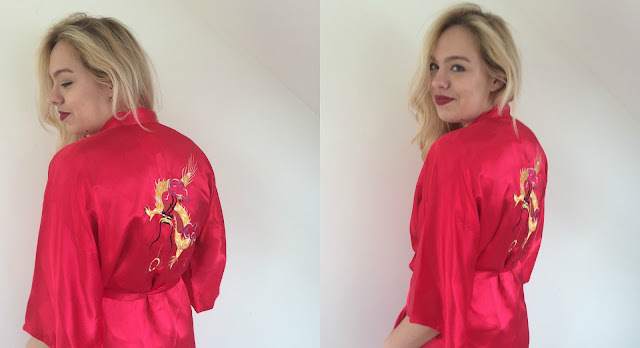 I wanted an alternative to my big fluffy white dressing gown for the upcoming warmer months- I thought that this kimono would be perfect for classy, comfy lounge wear. I am obsessed with the colour red at the moment so this gorgeous satin is amazing. I love the intricate oriental embroidery of a Chinese dragon on the back and clouds on the pockets. I just feel pretty fabulous wearing it and have been swanning around the house in it since I bought it. And at only £8... who could complain?! I adore vintage pieces as they are one of a kind and very special!